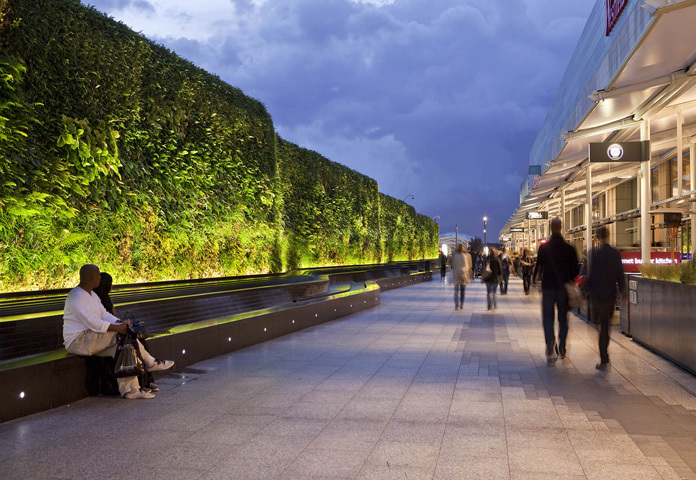 Westfield’s living wall mitigates the new development’s auditory and visual impact on local residents by providing a green envelope to the north and south facades of the shopping centre boundary, and contributes to the creation of new habitats. The feature enhances the outdoor dining and shopping experience and provides a vast swathe of natural green foliage and flowers for the enjoyment of visitors. It makes the most of the space available along the terrace, and in combination with the water cascade, it has become a highly popular space within the shopping centre, significantly contributing towards the commercial success of the restaurants in this area. As well as protecting the privacy of the neighbouring properties, the living wall enhances views towards the shopping centre. The living wall and water cascade form a popular day and night time destination, a place for relaxation and social interaction in the midst of a dense urban context. The wall provides a total of 1,275 sq. m of predominately native planting and new wildlife habitat in the middle of this retail complex. In addition to the aesthetic and ecological advantages that the living wall provides, it contributes to the urban environment by cooling the area in hot weather, filtering the air, and reducing noise. Creation of feature which would provide an uplifting, intriguing and vibrant setting for Westfield shopping centres outdoor cafés and restaurants. and integrate the shopping centre within its urban context, while making a significant contribution to the quality of environment. To provide maximum design and planting flexibility, and with a focus on future maintenance, the living wall was designed as a modular-cellular system. A system of 0.5m x 0.5m preplanted modules was selected for the high planting density that it achieves and the variety of species it supports. This system provided huge benefits in terms of speed of construction and buildability, and practicality for future maintenance, all within a cost-conscious environment. The side of the wall facing the shopping centre is north facing and it was necessary to develop a planting palette of predominantly native woodland plants, primarily ferns. To create seasonal interest and a fluid pattern, other plant species such as bergenias, snowdrops and anemones were incorporated. On its southern face, sun-loving species such as red fescue, sedum, honeysuckle and vinca were selected to give the wall a softer, lighter character. 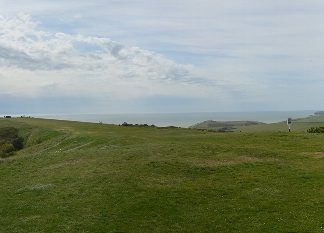 The study forms part of the landscape evidence base for the South Downs National Park Plan and is actively being used to support development management decisions and assess the impacts of proposed land-use change.